Preheat oven to 350 degrees and line muffin tins with paper baking cups. Recipe makes 24 cupcakes. Measure out sauerkraut and drain really well. Squeeze with clean hands to get as much of the liquid out as possible. Chop on a cutting board or in a food processor. In a medium size bowl, mix flour cocoa powder, baking powder, baking soda, and salt. Set aside. In a large mixing bowl for an electric mixer, beat the butter and sugar until creamy. Beat in the vanilla. Scrape the sides down and beat in the eggs, one at a time. When the eggs are blended in, add the flour mix alternately with the coffee, on low speed. Don't over mix. Stir in the kraut and chocolate chips. Pour the batter into muffin tins, fill 3/4 of the paper cups. Bake on the center rack for 24 min or until a tooth pick comes out clean. Let cool. 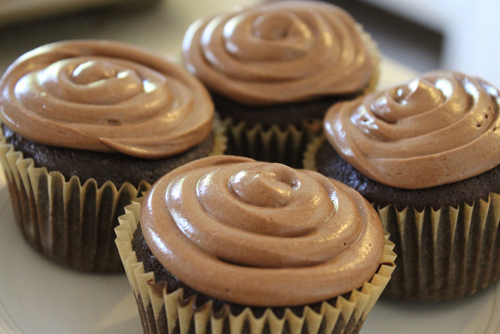 While the cupcakes are cooling, make your frosting. Melt the butter and chocolate chips in a small saucepan on low and stir until almost fully melted. Scrape into a mixing bowl for your electric mixer. Stir in sour cream and vanilla. Add the powdered sugar one cup at a time and beat until smooth and creamy. Add a tbsp of milk for thinner frosting. When cupcakes have cooled, transfer the frosting to a frosting bag, or ziplock, cut a small opening in the tip and decorate!